Spectators at the Pyeongchang Olympics aren't just getting to watch the ultimate showdown in winter sports. They're also witnessing the most high-tech Olympic Games in history. Major companies like Samsung and Intel are showing off their technology, including self-driving cars, virtual-reality viewing stations and super-fast video streaming. At the helm of it all is 5G, the wireless network technology that mobile carriers around the world have been racing to adopt. Pyeongchang, a previously little known city of just 44,000 people, has emerged as a vital testing ground. Intel (INTC) and South Korean mobile carrier KT (KT) are using it as the tech industry's largest 5G showcase yet. Smartphone users have been "promised a lot of things previously for 5G," said Peter Liu, a Singapore-based analyst at research firm Gartner. "We want to see how much can be really achieved in the commercial environment." Intel is hoping to dazzle fans with the technology by offering new ways of watching Olympic athletes. 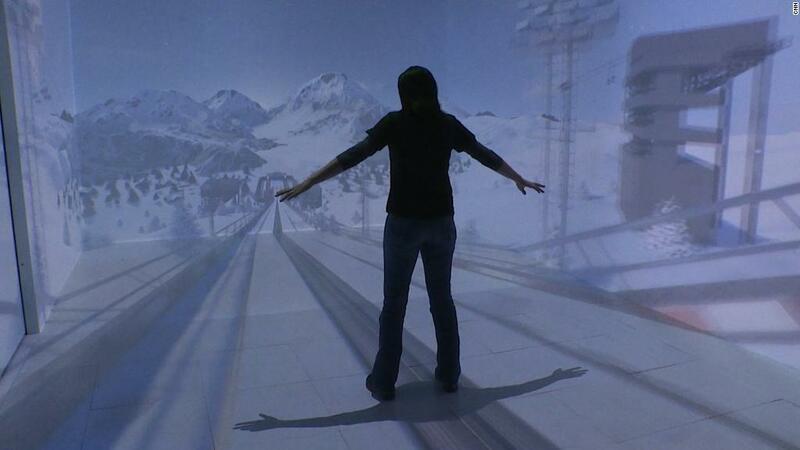 It's set up 5G stations to track cross-country skiers, deployed dozens of cameras inside an ice arena, and made this the first Winter Olympics to be broadcast live in virtual reality. "We're getting closer and closer to the athletes," said Rob Topol, general manager of Intel's 5G business. "Viewers can control the time, target, even the angle of what they're viewing." The frustration of watching a delayed live-stream should be gone, too. 5G networks are still being developed, but the technology is expected to eventually be at least 10 times faster than 4G. Intel is using all that firepower for the Games to roll out 4K and even some 8K video, which offer image quality many times higher than that of HD. "This is a blueprint of what 5G can look like," Topol told CNNMoney. But he stressed that what's available in Pyeongchang is still "an early showcase" of the technology's capabilities. The 5G signal that Intel and KT have set up covers a pretty limited area of roughly half a square mile. And guests walking into arenas won't see the internet automatically speeding up on their phones. To access 5G, they'll have to use Intel's tablets at certain "spectator zones." Other companies are also using the Olympics to demonstrate the possibilities of 5G. Hyundai (HYMTF), South Korea's top automaker, is letting visitors test out its autonomous Nexo SUV. The car successfully carried out a test drive all the way from Seoul to Pyeongchang, a journey of several hours, earlier this month without any human intervention. The Nexo's infotainment system uses KT's 5G technology, which lets users control smart home devices like locks or lighting systems from the road. Passengers can sing karaoke or stream videos in the backseat if they get bored. The SUV is the world's first self-driving electric vehicle to be powered by a fuel cell, according to Hyundai. That means that instead of running on gas, it uses electricity produced from a combination of hydrogen and oxygen. The same energy source is powering a number of Hyundai buses that shuttle between the venues. 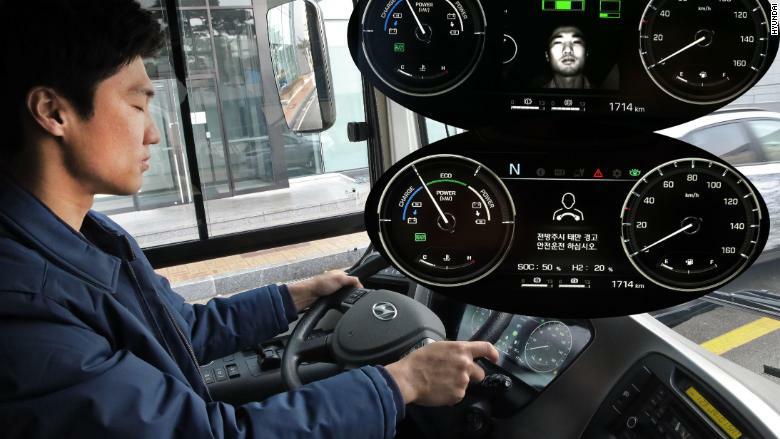 They're equipped with a system that monitors drivers' facial expressions and displays a warning if signs of sleepiness are detected. "We're trying to show our technology," said a Hyundai spokesperson. "It's one of the biggest sporting events in the world and the first Olympics [here] since Seoul Olympics, so for us it has great meaning." South Korea's biggest company, Samsung (SSNLF), is also using the Olympics to flex its muscles on virtual reality. The company says it's running simulated snowboarding and cross-country skiing competitions for fans, as well as a virtual reality "space mission" designed to let guests experience the feeling of lunar gravity. And before the Games, it equipped two Dutch skaters with so-called SmartSuits, which used sensors to track and send data about their body positions to a coach on a smartphone app. The coach was then able to analyze their performances and send the athletes feedback through vibrations on a wristband, according to a company video. The next Summer Olympics will feature even more advanced technology. Intel says the demonstrations in Pyeongchang are "a backbone" for what will be on show at the Tokyo Games in 2020. Many people still don't understand "how much 5G can do," said Topol. But in just a few years' time, he envisions the Olympic Village becoming a "smart city," where cars can send real-time data to traffic lights, and display boards can transmit information people are looking up on their phones. "You will see a lot of machines play a critical role," Topol said. "It won't just be about the smartphone in your pocket anymore."